Guinea pigs make great pets. They're cute balls of fluffy fur that are amusing to watch and fun to play with and care for. When choosing a guinea pig to adopt, there are a few things you'll want to look for to help you determine if the animal is healthy. Look at the guinea pig's overall body condition. A guinea pig should be neither fat nor skinny, with no swelling, lumps, or bumps. 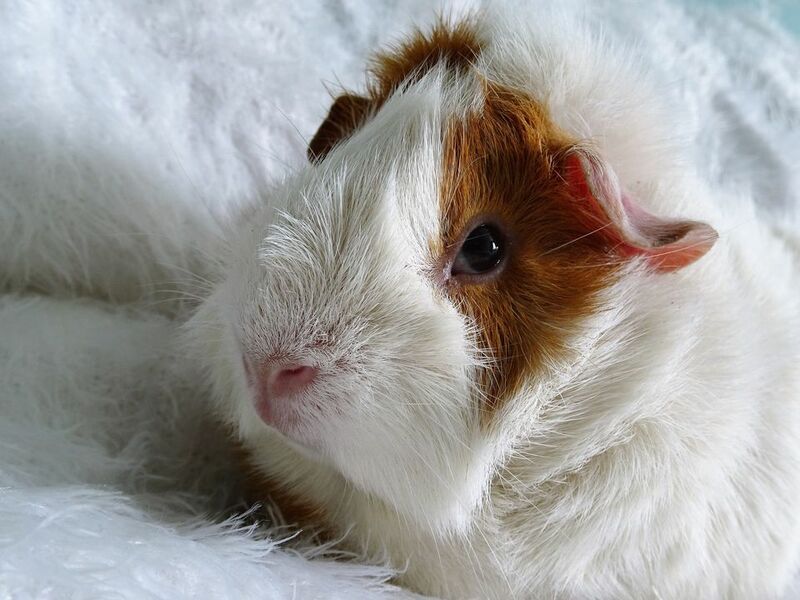 The guinea pig's coat should be well groomed (full, fluffy, and smooth looking), with no bare patches. Avoid guinea pigs with bald patches or red patches of skin. Also check for soiling around the rear end, as this may indicate a problem with diarrhea. The eyes, nose, and ears should be clean and free from discharge. Check the fur around the eyes and nose for signs of wetness, staining, or crusts. Try to get a look at the teeth as well. They should not be overgrown and should be well-aligned. Also, check for wet or matted fur on the chin. Observe the guinea pig's breathing. It should be quiet and not labored, with no wheezing, clicking, or gurgling noises. Guinea pigs should be bright and curious in attitude and never lethargic. You want an active and alert guinea pig. Take as long as you need to watch the guinea pig move around. It should have no signs of lameness, stiffness, or reluctance to move around. Observe how the guinea pig reacts to people. Many tend to be skittish at first, which is understandable in a pet store, breeder, or animal shelter situation. Ideally, try to pick a guinea pig that is relatively calm when it's approached and who is relatively okay with being handled. Look at the guinea pig's surroundings. The cage should be clean, with good access to fresh food and water, and not overcrowded. Guinea pigs kept under good conditions will be less stressed and have less exposure to disease. If any of the guinea pigs in the same cage, shelter, breeder, or store seem ill, resist the temptation to adopt from that place. If there is a contagious illness, your guinea pig may be next and there may be possible heartbreak ahead. Familiarize yourself with the differences between male and female guinea pigs. Make sure that wherever you get your guinea pig, they house the males and females separately. If the place does not separate them or seems unsure about the gender of the guinea pigs, then move on. It is best to avoid the possibility of a surprise litter after you get home. This is especially true in very young piglets. Guinea pigs can become pregnant by about 4 weeks old, but this would be extremely dangerous for a very young mom-to-be. Do not get a piglet younger than 6 weeks old. Female piglets should remain with their mothers until at least 4 weeks old. Male piglets should be separated at 3 weeks old since they can get their mother and sisters pregnant by 4 weeks of age. You want to add a few weeks after mother separation to make sure the piglet can thrive on its own. Before you try a store or breeder, look to a shelter or your local guinea pig rescue. There are many guinea pigs who need a second chance at a forever home. Quite often, these pets are given up because their previous owner simply could not care for them or they didn't get along with another pet in the household. There are typically very few behavior problems to worry about when adopting a rescue guinea pig. If you go to a breeder, make sure they are breeding for specific goals such as temperament and health. And, if you go to a store, make sure you can handle the guinea pig before you buy it. Do a quick health check and assess its temperament. As much as you may really want a guinea pig right away, feel free to walk away if something doesn't feel right. There are many excellent breeders and pet stores out there, but you may also come across ones that are less than reputable or keep their animals in unhealthy situations.